Background: The Stewart family records its traditional descent from Banquo, Thane of Lochaber, who makes an appearance as a character in William Shakespeare's MacBeth. Historically, however, the family appears to be descended from an ancient family who were senechals of Dol in Brittany. They were also present in force at the Battle of Killiecrankie.This prowess in battle is celebrated by the fact that the present Duke of Atholl maintains the Atholl Highlanders as the only private army in the kingdom. Motto: Virescit vulnere virtus, Courage grows strong at a wound. Arms: Or, a fess chequy Azure and Argent surmounted of a bend engrailed Gules, within a double tressure flory counterflory of the Last. Crest: A pelican Argent, winged Or, in her nest feeding her young Proper. Supporters: (On a compartment embellished with seedling oak trees fructed Proper) Dexter, a savage man wreathed about the head and middle with laurel and holding in his right hand a club resting on his shoulder all Proper; sinister, a lion Gules. The Stewarts, who were to become monarchs of the Scots, descended from a family who were seneschals of Dol in Brittany. They acquired estates in England after the Norman Conquest and Walter Flaad, the Steward, moved to Scotland when David I claimed his throne. He was created Steward of Scotland and granted extensive estates in Renfrewshire and East Lothian. He was one of the commanders of the army which defeated Somerled of the Isles in 1164. James, the fifth High Steward, swore fealty to Edward I of England, but later joined Sir William Wallace and on his death, Robert the Bruce, in the struggle for Scottish independence. Walter, the High Steward, married Marjory, Roberts daughter, and when Bruces son, David II, died childless, he was succeeded by Bruces grandson, Robert Stewart, who reigned as Robert II. The first Stewart king had many sons. His eldest, John, succeeded to the throne as Robert III; his third son, Robert, Duke of Albany, was Regent during the reigns of his father, his brother and his nephew, James I; his fourth son Alexander, Earl of Buchan, famed as the Wolf of Badenoch, was responsible for the destruction of the elegant cathedral at Elgin. When James I became of age, he curbed the power of his cousins of Albany by beheading Roberts son, Murdoch, along with the latters sons and father-in-law. The royal line of male Stewarts continued uninterrupted until the reign of Mary, Queen of Scots, and as a family they held the throne of Scotland and later that of England in the direct line until the death of Queen Anne in 1714. The present royal family still has Stewart blood, both through Sophia of Hanover, granddaughter of James VI, and the mother of the present queen, formerly Lady Elizabeth Bowes-Lyon. Apart from the royal house, three main branches of the Stewarts settled in the Highlands during the fourteenth and fifteenth centuries: the Stewarts of Appin; of Atholl; and of Balquhidder. 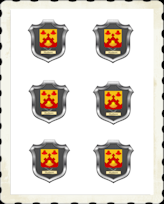 The Appin Stewarts descend from Sir John Stewart of Bonkyl, son of Alexander the fourth High Steward. Sir Johns younger son, Sir James Stewart, was killed at the Battle of Halidon Hill in 1333. His grandson married the heiress of the Lord of Lorne, and their son became the first Stewart Lord of Lorne. In 1463, the dispossessed Macdougalls murdered the next Lorne heir whose son, Dugald, became the first Stewart to hold Appin. Duncan, second of Appin, was appointed Chamberlain of the Isles by James IV and built Castle Stalker, which was sometimes used as a royal hunting lodge. Duncan Mor, eighth of Appin, took the field under Montrose in 1645 at the Battles of Inverlochy, Auldearn and Kilsyth. He was outlawed and his lands were forfeited, although they were later restored after the accession of Charles II to the throne. The Stewarts of Appin came out in 1715 for the Old Pretender, and fought at the Battle of Sheriffmuir. The chief was attainted for treason and fled into exile. Charles Stewart of Ardsheal led the men of Appin during the rising of 1745, and many fell at the grim field of Culloden, having first gained glory by breaking the Redcoat ranks. Colin Campbell of Glenure, the Red Fox, was placed as government factor on the forfeited Stewart estates. His murder in 1752 has been immortalised by Stevenson in the novel, Kidnapped. After the chief suspect, Alan Breck Stewart, made his escape, James Stewart, the half-brother of the chief, was tried by a jury comprised entirely of Campbells at Inverary presided over by Argyll himself, and, perhaps notsurprisingly, was convicted and hanged. The Stewarts of Atholl descend from a son of the Wolf of Badenoch. James Stewart built a strong castle at Garth and settled there towards the end of the fourteenth century. In 1437 Queen Joanna, widow of James I, married the Black Knight of Lorne who was descended from the fourth High Steward. Her son by this marriage, Sir John Stewart of Balveny, was granted the earldom of Atholl by his half-brother, James II. He supported his brother by commanding the royal forces who suppressed the rebellion of the Lord of the Isles. John, fifth Earl, died with no male issue. His daughter had married William Murray, second Earl of Tullibardine, who was created Earl of Atholl in his own right in 1627. Many Stewart families continued to live around the Atholl lands, many of them claiming direct descent from the numerous illegitimate progeny of the Wolf of Badenoch. They largely transferred their allegiance to the new Murray Earls of Atholl, calling themselves Athollmen. This is commemorated by the right still exercised by the present Duke of Atholl to maintain the Atholl Highlanders as the only private army in the kingdom. The new allegiance was sometimes sorely tried. In 1689 Murray called out the Athollmen for William of Orange, but his baillie defiantly held Blair Castle for James II. In 1715 Atholl again supported the government but his heir, the Marquess of Tullibardine, was a Jacobite. Stewarts flocked to the banner of Bonnie Prince Charlie in 1745. General David Stewart of Garth, an Athollman, was an officer in the 42nd Regiment (the Black Watch) whose book, Sketches of the Highlanders and Highland Regiments, did much to popularise his homeland in Victorian England. Stewarts came to Balquidder when William Stewart of Baldorran, grandson of the only son of the Duke of Albany who escaped the persecution of James I, was appointed baillie of the Crown lands of Balquhidder around 1490. The Crown lands were eventually divided and granted to various noble families, and Williams grandson, Alexander, settled in Ardvorlich at the end of the sixteenth century. It is generally accepted that the Earls of Galloway now head the principal house of this great name. Name Variations: Stewart, Boyd, Carmichael, Conacher, Cook, Crookshank, Crookshanks, Cruickshank, Cruickshanks, Dennison, Denniston, Duilach, Duilach, France, Francis, Fullarton, Garrow, Gray, Larnach, Larnack, Lay, Lennox, Lisle, Lombard, Lumbard, Lyle, MacCloy, MacGarrow, MacGlashan, MacKirdy, MacMichael, MacMunn, MacMutrie, Menteith, Monteath, Monteith, Moodie, Moody, Sharp, Steuard, Steuart, Stewart, Stewart of Atholl, Stewart, Royal, Stuart, Carmichael, Clay, Combe, Combich, Combie, Conlay, Conley, Donlevy, Leay, Levack, Livingston, Livingstone, Lorne, MacClay, MacCleay, MacColl, MacCombe, MacCombich, MacCombie, MacComie, MacDonleavy, MacKindlay, MacKinlay, MacKinley, Maclae, Maclay, Maclea, Macleay, MacLew, MacMichael, MacNairn, MacNucator, MacRob, MacRobb, Mitchell, Mitchelson, Robb, Stewart of Appin, Walker, Stewart of Appin.